Terri Peterson of Sweet Pete's Alpacas for their purchase of Hazel, Serafina, Lucy, Davis, and Frisco. Steve & Cindy Selph of Lake Liaho Alpacas for their pruchase of Lady Sady and C6 Almondine. 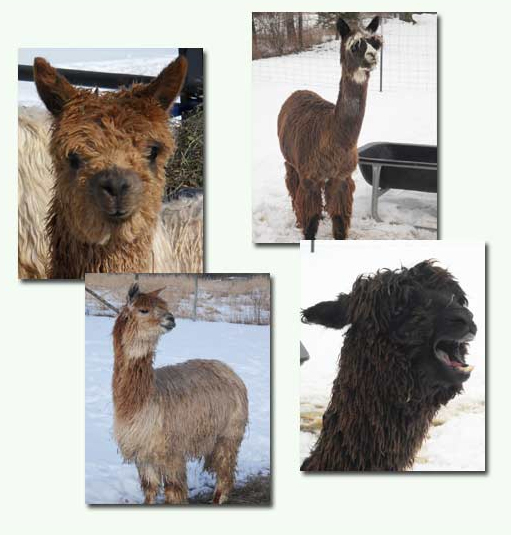 Cora Foley of Alpacas of Tealwater Ranch for their purchase of Darcy, Baby Rosie, and Baby Hope in 2007 and Tilly and Cleo later. Steve and Kathy Bergeman of Breakstone Ridge Alpacas for their purchase of Pearl in 2007, and their purchase of Meggie and Diamond. Becky and Duane Thompson of Shootin' Stars Alpacas for their purchase of Margot. Shelly Morris of Dos Rios Suri Alpacas for her purchase of Delilah. Mike and Candy Risch of Bookmark Alpacas for their purchase of Minnie and Gracie. Callie Welch for her purchase of Fiona, Squirt, Dude, and Gold. Orlin and Linda for their purchase of Davis.